Double Glazing Repair UK are one of the UK’s most trusted double glazing repair companies. With over 20 years experience in the trade, our technicians operate in and around the county of Hampshire extensively servicing the Southampton, Bournemouth and Portsmouth areas. Our double glazing repair and replacement work is always carried out to the highest of standards to ensure complete customer satisfaction. Our workmanship will not only meet our own high company standards, it will also meet the current industry standards. Our technicians are FENSA registered to ensure that our finished installations carry a valid FENSA certificate for use when insuring or selling your home. Contact a member of Double Glazing Repair UK now to arrange your FREE estimate. We also offer a range of additional security products for your windows, doors and conservatories. Double Glazing Repair UK is a FENSA registered company; this means all of our work complies with the current FENSA guide lines for economy and quality. If you do not have the FENSA certificate for your windows and doors you might not be able to get insurance for your property, these certificates can also requested by on the sale of the property where an original window or door has been replaced or installed. All of our windows and double glazed products are fitted in conjunction with the GGF’s fitting guidelines. Being a member of the GGF ensures that Double Glazing Repair UK work is fully insured and covered by a 10 year insurance backed guarantee. Checkatrade is a relatively new website that aims to monitor companies and show feedback from customers that have recently used the company in question. 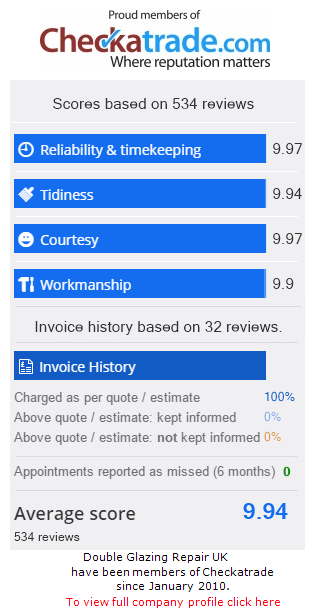 We have a rating of 9.9 out of 10 from over 300+ ratings on Checkatrade.